This is one of the core projects of Morishima-lab. in which Future Cast System is drastically updated and advanced to be a very affordable technology. A face geometry estimation method with light calculation cost and high accuracy only from a single picture using face prior from a collected face database is proposed at first. 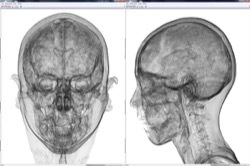 Then from video captured face image, a much more accurate 3D face geometry can be reconstructed by utilizing a Structure-from-Motion method to calculate 3D coordinates of sparse feature points as well as a former 2D feature points and face priors of frontal face image. And now, new trial is performed to achieve a higher depth accuracy by utilizing a normal information calculated by Shape-from-shading or by utilizing only a diagonal face silhouette curve information.